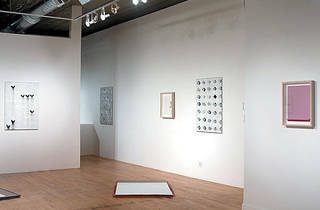 Photograph: Courtesy of Shane Campbell Gallery Installation view, 2009. Aside from fears you might stomp on Lisa Williamson’s three Low and Horizontal sculptures as they lie on the gallery floor, you won’t find much drama in this mellow, understated introduction to two Los Angeles artists. New works by Williamson and Olson—friends who have neighboring studios—mingle seamlessly in the gallery. But the artists don’t engage in a dialogue, and their visual language is so minimalist it muffles whatever they hope to communicate. The titles of Olson’s paintings link them to the written or printed word, but their black marks are abstracted into illegibility. In Announcement, she lays horizontal black squiggles over a rough white rectangle defined by orange, yellow and pearlescent white lines. Floating in a sea of tiny black dots, this assemblage of forms suggests a stack of cheerful flyers. While the dynamic squiggles also appear in Olson’s diptych Jane Birkin Autograph, her other works on view are more subdued. In Murmur, Articulation and A Play of Prints, the artist overlaps silver, matte black and pearlescent white paint to form patterns of diamonds, allowing the black paint to leave inklike residues on the enticing, shimmering surfaces of her light-colored canvases. 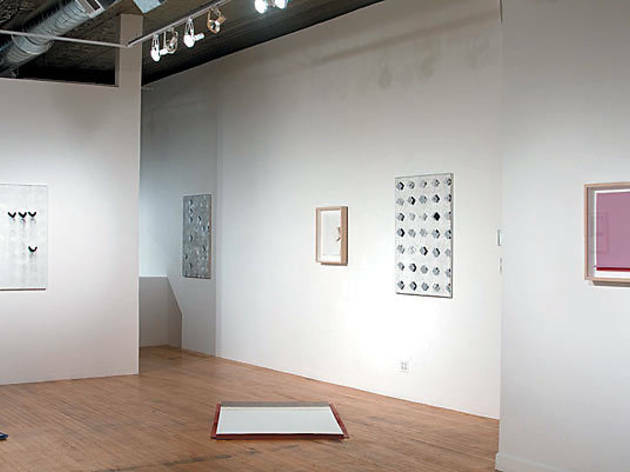 Though Williamson appears more concerned than Olson with color and three-dimensional space, her sculptures and collages come off as similarly reductionist. The pieces on the floor, subtitled Bed, Roll and Floor Plan, compress their subjects into simple pieces of cut paper laid atop thin sheets of wood. More potential meanings cram into This Mouth, a wall-mounted collage of pink paper that splits at the bottom, revealing two red inner folds. Its racy ambiguity shows less really can be more.